www.johnseed.com: Royal Nebeker: "Life is but a dream..."
Artist Royal Nebeker has what just may be the world's coolest studio space: he paints on the top floor of a former fishing facility - The Uppertown Net Loft - a battered and picturesque wooden building that sits on pilings 100 yards from the shoreline of Astoria, Oregon. 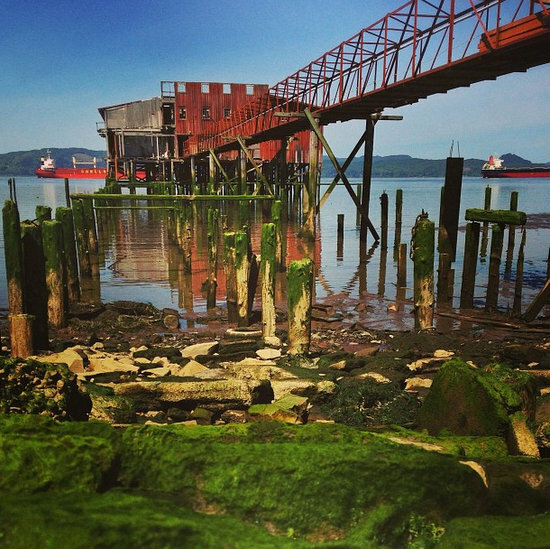 Originally built in 1897 as a satellite station where salmon fishermen could drop off their catch, the building has been declared eligible for the National Register of Historic Places and will hopefully become a cooperative of artist's lofts in the near future. For now, it is Royal Nebeker's personal studio and castle, with the Columbia River serving as its moat. Born and raised in California, Nebeker has lived mainly in Oregon since 1974: he was originally attracted to Astoria because it reminds him of Norway, a place of importance in his personal history and artistic imagination. Because he has shown primarily in Europe and the Northwest, his works are not widely known across the U.S. and his style - a rich smörgåsbord of cultural, personal and aesthetic influences - doesn't fit neatly into any given box. Nebeker's fluidly brushed canvases often look somewhat like Bay Area Figurative paintings, but his works have a combination of psychological insight and spiritual intensity that is remarkable and distinctive. Royal's situation in relation to the contemporary art world is very like that of his friend, the late Nathan Oliveira who once stated: "I'm not part of the avant-garde. I'm part of the garde that comes afterward, assimilates, consolidates, refines." Working offshore at the Net Loft - 3,000 miles from New York City - has given Royal Nebeker plenty of creative privacy and helped forge the character of his art. 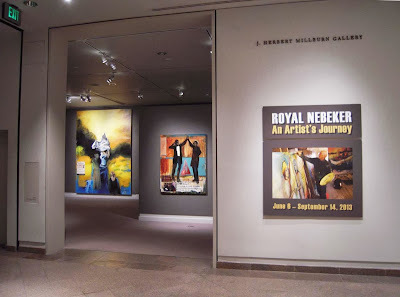 A former ski instructor who remains quite fit in his late 60s, Royal spent the first half of May working with a crew of Astorian carpenters crating 29 large oil paintings for shipment to the Brigham Young University Art Museum, the first stop on a traveling retrospective of his work organized by the John Natsoulas Center for the Arts. Getting the paintings crated - including one canvas measuring nearly 15 feet tall - then down the narrow stairs of the loft then down the building's ramp to an onshore moving truck was exhausting. Of course, it was nothing compared to the effort that Nebeker has exerted in rebuilding his studio inventory and career momentum since the catastrophic storm of 2007. Between December 1st and 3rd of that year, a three day long freak storm that has gone down in history as The Great Coastal Gale brought wind gusts of up to 165 miles per hour. The winds lifted up parts of the building's top floor and roof, and badly damaged the historic building - which Nebeker and his wife Sarah own - trapping Royal and his assistant in the building for some 20 hours. They got out by strapping themselves to a heavy ladder and crawling down a ramp on their bellies. Sarah Nebeker was understandably pleased and relieved when Royal telephoned her to say "We got out alive," but several years of his artistic output had been destroyed. A less dedicated artist might have thrown away his brushes, but Nebeker, who has been at the easel nearly 50 years, managed to get his studio up and running again and has actually been quite productive since. The show now on view at the BYU Museum - Royal Nebeker: An Artist's Journey - includes seven large recently completed oil and collage pieces alongside thirteen large earlier works. One of his most striking recent paintings, titled Ship of Fools is part of an ongoing series: Loss and Revelation. 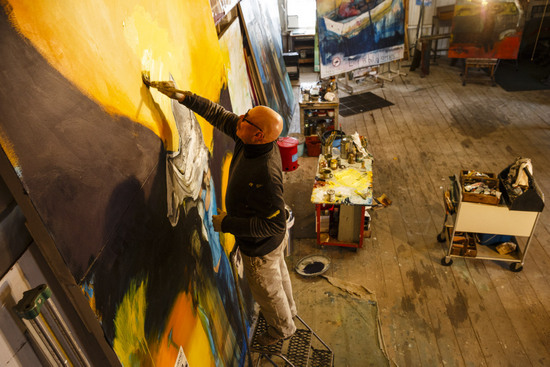 Losing two years of paintings and surviving a cataclysmic storm certainly must have something to do with the painting's storm-tossed allegory, but Nebeker isn't an artist who literally channels the events of his life into his work. In fact, his references are most often oblique and derived more from his dreams than from his day to day experiences. He says: "I've found that using filters like dreams and memories helps me capture the essence of things and cut to the heart." Royal keeps a dream journal by his bedside, and the richness of his dream life provides him with an un-ending stream of ideas. 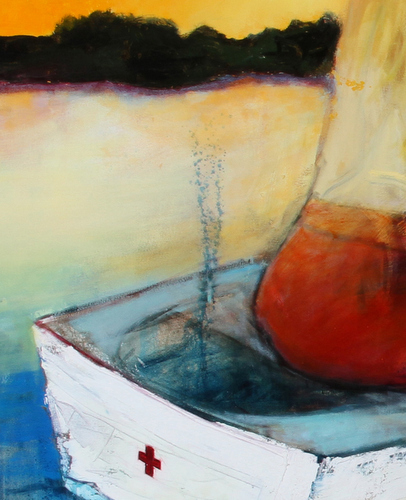 Ship of Fools reveals a man in a dunce cap who looks our direction as he rows a blonde-haired woman across a roiling blue ocean over skeins of painterly drips as a blazing cadmium yellow sun sets in an orange and greenish sky. At first glance, it could be seen as an Expressionist painting - an allegorical voyage à la Max Beckmann - but Nebeker isn't scornful or self-pitying enough to be a true Expressionist and even his toughest pictures feel uplifting in their message. "Nebeker's pictures have a wonderful core of Humanistic values," says Paul Anderson, a curator at the BYU Museum, "He is not a cynic." He also has a healthy sense of humor and an awareness of human foibles. The couple in the boat are oblivious to the leak that spurts skyward behind the woman's back, and the man doesn't seem to be rowing very intently. Several menacing shark fins are visible in the dark water beneath them. Perhaps the picture is to some degree a portrait of a marriage, but in looking at a Nebeker one should never be to quick to make that kind of easy assumption. Royal has made many paintings that deal with relationships between men and women, but he has also made a number of self-portraits in which he takes on a female identity. The figures in Ship of Fools might be a couple, but they might also be aspects of a single self: or both. Like many of his collage-paintings, Ship of Fools combines rough brushwork and drips with collage elements, written phrases and notations. Nebeker is one of a handful of contemporary artists - Jean-Michel Basquiat, Cy Twombly and Squeak Carnwath are some others that come to mind - who seem to have found just the right way to marry expressive imagery with snippets of language that function both as "notes" and graphic elements. One of Nebeker's common practices is to leave some horizontal space near the lower edge of the canvas as a place where these kinds of images and notes can accumulate. Working this way allows him to combine the high traditions of painting with pop culture materials, and to make his images both emotionally and intellectually rich. 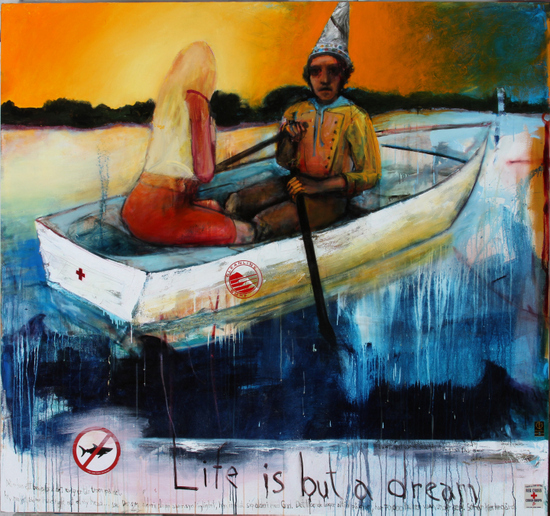 Ship of Fools has a jaunty no sharks decal towards the lower left, which seems to graphically rhyme with a round logo on the boat's hull (Cleanline Surf) but the most prominent written element is a phrase from the song Row, Row, Row Your Boat: Life is but a dream... In the context of Royal's painting the rather trite lyric from a round often sung around campfires suddenly feels significant, even Shakespearean. There are some other inscriptions present and one of them, from the Danish philosopher Søren Kierkegård, is in Danish. Translated, it reads: "The person who never leaves reason never reaches a connection with God." Another Kierkegård quote enhances the allegory of the voyage as a spiritual quest: "The believer lies always above the deep; he has 70,000 leagues of water under him." Paul Anderson notes that "There is a wonderful interplay between high culture, pop culture and spirituality in Nebeker's works. Most have spiritual themes without being overtly religious." 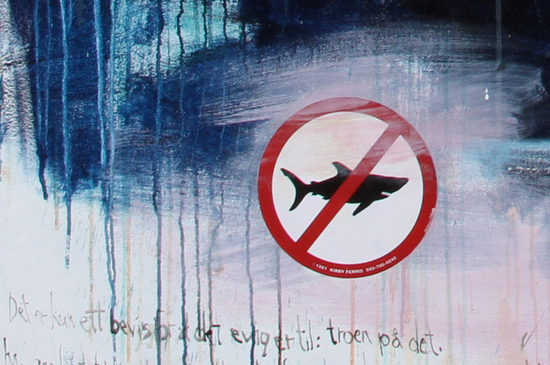 Nebeker, who has Norwegian ancestry and has lived in Norway, has been asked "Why do you write on your paintings in Norwegian, Japanese and English?" His answer is: "I don't like the way English looks, it is so blatant. It is too easy to take literally, too easy to see what it means. I don't intentionally obscure meaning, but I distrust clarity." For that reason, looking at a Nebeker can be like listening to an opera in a foreign language: the emotion comes through even if the words can't all be deciphered. Norway is often the setting for his paintings - Nebeker says he dreams about Norway - and the works of the Norwegian master Edvard Munch have exerted a major influence on him as well. In 1972 Royal received a grant to live in Munch's studio and living quarters in Ekley where he read the artist's journals and also helped organize the artist's archive of prints. At the time, Munch's work was out of favor in Norway, but Nebeker was very moved by his direct experience of the artist's environment and archives. Royal's interest in imbuing his paintings with psychological motivations and the inclusion of writing in his works both began with this crucial engagement. 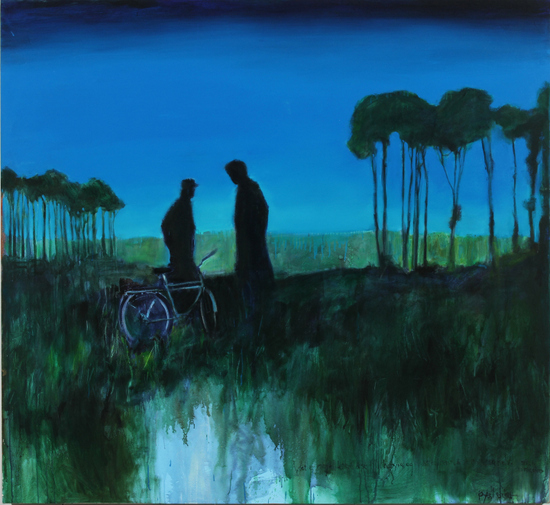 Nebeker's 2013 oil The Blue Bike certainly feels quite a bit like a Munch painting: it is a deeply felt moment shaded by memory. The painting is centers on the silhouttes of Royal and his father facing each other across an isthmus in a nocturnal dreamscape. The Blue Bike distills Nebeker's recollection of the disappointment he felt as a boy when he received an inexpensive green bicycle from his father after hoping for a top of the line blue Schwinn. 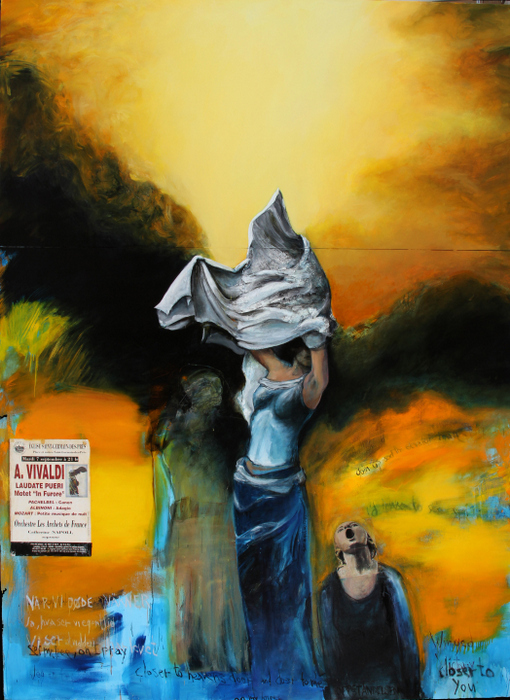 The canvas also alludes to Nebeker's mature, guilty realization that his father had been a man with limited resources he did all he could for his son. "They stand so awkwardly," observes Paul Anderson of the two silhouettes; "two people who don't quite understand each other." The image of the father and son carries a very strong emotional charge: it makes the resulting painting nostalgic, apologetic and cathartic. 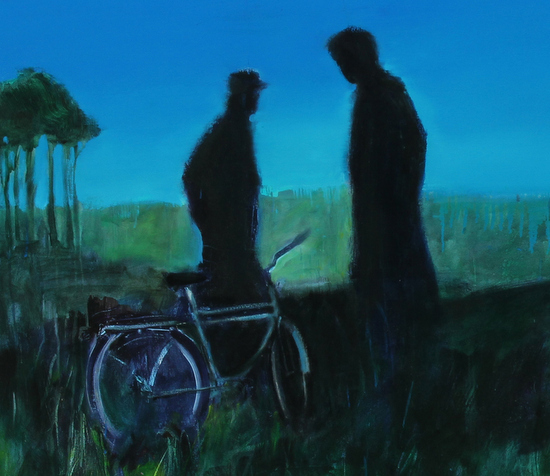 Like many of Nebeker's strongest works, The Blue Bike is about human relationships, their emotions clarified and magnified through the filter of dreams. "What shall we then see?" We find that we have never lived." Although resurrection has certainly been a theme used by many artists for hundreds of years, the idiosyncratic nature of Nebeker's painting demonstrates how Nebeker has come to the theme on his own terms. There is a paradox at the heart of Nebeker's art that goes like this: by presenting his personal dream world, infused with cultural references and anecdotes that mean something to him he causes his viewers to think more deeply about universal themes. Not all of us have read or seen the works of Ibsen, but at some deep level we can all connect with the universal human craving to reawaken to life's beauties and deeper meanings. When We Awaken is actually two canvases: Nebeker added a second horizontal canvas at the top as the painting developed, realizing that his figures needed more room to ascend. His career as an artist also seems to have needed some more room at the top as well. Since the storm and losses of 2007 Royal has certainly had his own kind of rebirth, and his energy is at a peak. "I have all kinds of paintings waiting," Nebeker comments: "My mind churns around as I resurrect all kinds of ideas, worrying that I didn't say enough the first time around."